Woollatt Building Supply is proud to be a distributor of StoneRox quality stone veneer products. StoneRox is a thin veneer manufactured stone; it is lightweight: 8-10 pounds per square foot and is made from lightweight aggregates, Portland cement, coloured pigments and a variety of admixtures. ABOUT STONEROX: StoneRox makes building and renovation simple and affordable with beautiful, Canadian-made products that are lightweight, durable, easy to install, and able to create distinctive, individual features, inside or outside. 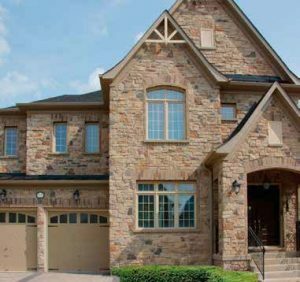 As a privately-owned company, they promise to offer the highest quality stone veneer products, impeccable service and work with the utmost integrity as they have over the past twenty years. Their experience has earned them an outstanding reputation: they have been awarded the Greater Toronto Home Builders/UDI Association, Member of the Year in 2006, and in December 2007, were awarded The Manufacturer/Supplier of the Year by the Building Land Development.